Gardaí are quizzing a man in connection with the murder of Patrick 'Pa' O'Connor in a packed pub. The suspect, aged in his 40s, was arrested by gardaí yesterday and brought to Henry Street garda station in Limerick City for questioning. The man is being detained under Section 4 of the Criminal Justice Act, which allows gardaí to question him for up to 24 hours without charge. Mr O'Connor (24), from Kileely, Limerick, was stabbed to death while he was socialising in Fitzgerald's Bar, Thomondgate, Co Limerick, on Saturday night. He had been watching the World Cup just hours before the incident. Mr O'Connor was rushed by ambulance to University Hospital Limerick where he died from his injuries in the early hours of Sunday. Gardaí have launched a murder investigation and have set up a special incident room at Mayorstone garda station. Superintendent Derek Smart, who is leading the investigation, has been granted a further 48 hours in which to hold Fitzgerald's Bar as a designated crime scene. The application was made before Limerick District Court, sitting in Kilmallock, around 6pm on Sunday. Gardaí attached to the technical unit are continuing to carry out forensic investigations at the pub. 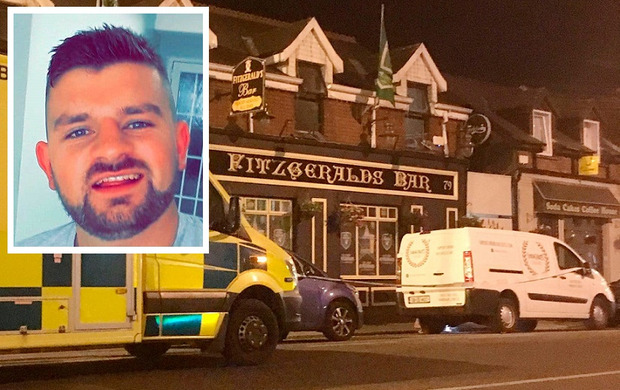 According to Garda sources, Mr O'Connor and the suspect for his murder were in one another's company at Fitzgerald's Bar "for a couple of hours" on Saturday night. Gardaí said they had no clear motive for the attack, but believe Mr O'Connor was fatally stabbed in front of crowd of onlookers inside Fitzgerald's Bar. Appealing for witnesses, Supt Smart said there was "a large number of people within the public house [Saturday] evening [watching] two World Cup games early afternoon and into the evening". "A number of people have come forward and we have actively interviewed them and taken statements from them, and I'd like to thank them for coming forward to us," he said. However, Supt Smart added that "a number of other people haven't come forward yet, and we are seeking their assistance to tell us what they saw within the public house". A post-mortem examination on Mr O'Connor was set to be carried out by Deputy State Pathologist Dr Margaret Bolster yesterday. Anyone with information for the Garda investigating team has been asked to contact Mayorstone garda station on 061 456980, or call the Garda Confidential number on 1800 666 111. "It might be the vital part of the jigsaw that we need," said Supt Smart.